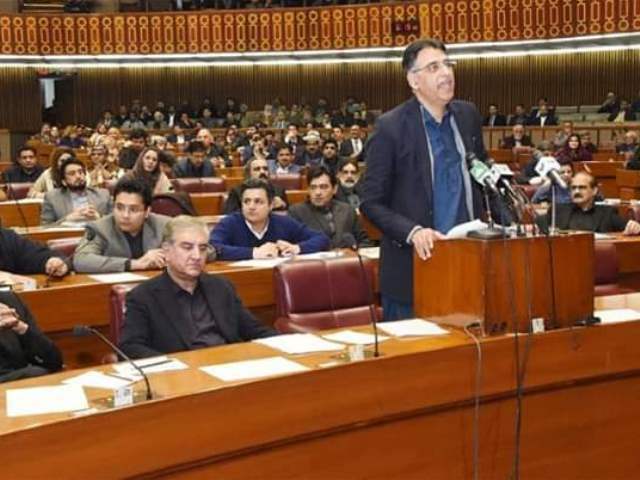 Finance Minister Asad Umar presented the Finance Supplementary Second Amendment Bill, 2019 (also known as the mini-budget) during the National Assembly session on Wednesday amid jeers and shouts from the opposition. This is not a new budget, he clarified. We want to ensure that this is the last IMF programme the government has to take, he said. We don’t want the people to hear that the government has to go to the IMF because of the previous government’s negligence, said Umar. He accused the previous government of trying to buy the election with its budget. The deficit should have been 4.1% but at the end of it was 6.6%, he said. “Where was that money supposed to come from?” he asked. “It won’t come from their [the opposition’s] Swiss bank accounts, it will come from the people’s pockets,” he said. Non-filers can now buy cars with engine capacity of 1300cc and below. This means they can now buy any cars from Suzuki Wagon R to Honda City and Swift. Previously, non filers were not allowed to buy new cars. Motorcycles and rickshaws were an exception because buyers of these automobiles belong to lower income groups. Umar said the tax rate on cars is being increased but didn’t mention the actual increase. Non-filers are people who do not file their tax returns with the Federal Board of Revenue. They include both people who pay tax on their income and those who evade it. The cabinet approved the re-imposition of the mobile phone service consumption tax but Umar didn’t mention it in the mini budget. You now will only get Rs70 worth of credit on every Rs100 top-up. Previously the Supreme Court had barred the government from deducting any tax on mobile phone pre-paid cards. The SC order allowed users to consume Rs100 credit in its entirety with no tax on phone calls or text messages. The government has approved a 30% tax on mobile phone cards. The government will also be increasing the tax on high-end mobile phones. The tax on phones costing more than $350 has been increased. Financial institutions will now be charged a 20% tax in place of the current rate of 39% if they extend loans to facilitate the growth of agriculture (small farmers), SMEs, and low cost housing sectors. This means you are more likely to get a loan for starting a business because the banks have been given incentives in the form of lower tax on income generated from loans given to these sectors. The government has abolished the minimum withholding tax on banking transactions and withdrawals exceeding Rs50,000 for filers. There has been no relaxation on property as the government continues with the previous policy. This means non-filers will not be able to buy property worth more than Rs5 million. Only overseas Pakistanis and those who inherit property from their parents will be exempt from this restriction. PSL tickets may be cheaper this year as government exempt all sports franchises from taxes with effect from July 1. The government has removed all withholding tax for traders in the Pakistan Stock Exchange as well as super tax (but banks still have to pay the tax). Before he presented the mini-budget, the opposition called for the Punjab chief minister and the prime minister’s resignations over the Sahiwal killings. Leader of the opposition Shehbaz Sharif said the CM cannot even respond to the call of nature without the premier’s permission. He also called PM Imran Khan a “selected prime minister”. “Ministers of the federal and Punjab governments said the joint investigation team’s report on the Sahiwal incident will be presented within 72 hours by Wednesday evening, but it did not happen,” said Shehbaz, addressing the lower house in mini budget session. The PML-N president asserted that all the officers involved, including the Lahore RPO, were suspended from services same night of the Model Town tragedy. The PML-N’s provincial government took immediate action before even announcing the formation of a JIT, he told the lower house. “I had announced a judicial commission under a judge of Lahore High Court to investigate the Model Town tragedy,” he said. “The selected PM showed up at parliament after three and half months,” said Shehbaz pointing to Imran Khan who was sitting across the aisle. “Prime Minister Imran Khan had recommended that I and (then law minister) Rana Sanaullah step down over Model Town tragedy. Rana Sanaullah and Dr Tauqir tabled their resignations voluntarily,” said the opposition leader. He demanded the premier and Punjab Chief Minister Usman Buzdar step down. Foreign Minister Shah Mahmood Qureshi slammed the opposition for derailing the session and said they have had two days to discuss the Sahiwal incident. He said it was a terrible tragedy for the whole nation and asked his fellow parliamentarians to stop using it to score political points. Related: Sahiwal shooting: Who gave the order to shoot? His speech was met with shouts and interruptions from the opposition. He highlighted the government’s performance in the investigation and said they will not be shielding any government officers or police officers, unlike their predecessors. We immediately investigated the killings and a JIT was formed, which has concluded that the Khalil family was innocent and they were murdered, said Qureshi. We didn’t try to conceal things, he said, pointing a finger at the opposition. We are ready for in camera briefings in front of the media, he said, adding that the case will soon be heard in an ATC. “We won’t hide the truth from the public,” said the minister. We will conduct a fair trial and the truth will come out, he said. FBR registration form to become a tax payer should be simple, useful, and meaningful rather a dump of unnecessary information. The 15 pages form has a lot of non sense questions such as the area of the house you are living, name and CNIC of owner, utility bills etc. Further, a person who willing to registered for tax purpose will show his/her link to another (wife/husband/father etc) which i believe doesn’t make any sense. Tax registration should be easy and convenient for everyone. In other countries, govt never ask about personal bank account information, wife or husband information but here fbr put everything in it and this may be one of the reasons people dont want to registered. Govt should review the form and take off all unnecessary things to make it suitable and acceptable for people.